C9 CoalFire gas coal set with Classic basket. Footprint Dimensions. 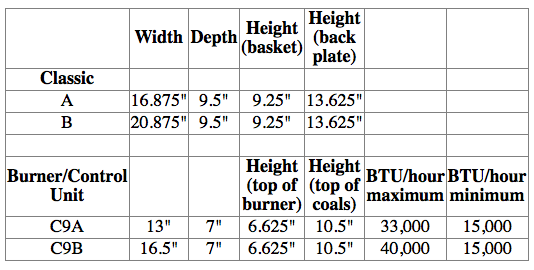 Your fireplace must be able to accommodate the following dimensions for the basket to fit within your firebox. The absolute minimum fireplace depth is 6.5″, which is the maximum forward-most projection of the flame. The burner control units are available with our “EASY” Remote Ready Control (transmitter device required for operation – see prices for options) and Variable Flame Height Remote Control, for Natural Gas and Propane. pieces that hold the coals, as well as from the coals themselves. Click the button below to add the CoalFire Vent-free set with Classic Basket to your wish list.